First things first - I'm giving away a feature ad for the month of January here. I don't ever really give away ad space, so this is pretty sweet. If you're interested, go enter! 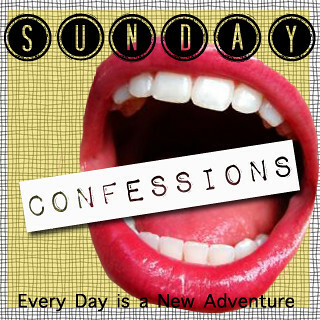 Now to the confessions - please link up to a specific confessions post, not just to your blog. Also... if you have the time, visit some of the other links and introduce yourselves - part of a link up is making friends, right? 1. I HATE it when blogger's names in comments are linked to their google profile instead of their blogger profile. It drives me nuts. Half the time I can't visit your blog because you "haven't shared anything with" me. And if you have, I have to dig to find your blog. Just link it to your blogger profile, please! 2. I have a MAJOR sweet tooth. It's kind of a problem - yesterday I ate a whole bag of skittles (not the fun size, but smaller than the full-size), some airheads, a lindt truffle, and some chewy sweet tarts. Please don't tell baby that I didn't get my veggies. At least I took my prenatals? 3. I'm going as a thug for Halloween just so that I can wear sweats. We get to wear costumes to work on Wednesday, and I want to be comfy, so I'm going as a thug and wearing sweats. Yeah, I know I'm a genius. 3. I kind of want to redesign my blog. I know, I know, I barely have enough time to do anything, let alone a redesign, but I'm just not feelin' it. 5. I'm proud of our win last night, but I'm sad that we didn't win by beating their first-string quarterback. I mean, Rex Burkhead is out and he's one of our star players, so that makes it a little better. Either way... GO BIG RED!!! Link up your confessions below!! But first... November's genre for book club is crime/mystery. If you have any suggestions, please put them in the form below! Um. Excuse me what??? Prenatals? I clearly have fallen sorely behind in my reading. Unless I'm totally misreading this I think this calls for a majorly HUGE congratulations! Sorry that I'm so behind. But Yayyyyyy!!!!! I don't know if my name is liked to my google account or blogger account, I will have to look into that. Any excuse to wear sweats is great! I am kinda lucky I work for a sports company so I can wear comfy clothing any time I like. I also hate when they're linked to their google profile - what is with that? Ha! My first confession was a blogger related one too! I'm pretty sure my profile lists my main blogger, I wish I could find a way to list my beauty and cooking blogs as well! I have to agree with you on #1 AND #2 (except the prenatals..) Yay! How exciting!! #3 you're totally rockin' this look btw!! I love the thug face too! #4 Why not?1 I've felt the same way about my little blog..ever since I started my blog lol #5 I don't know football, sorry. I tried to learn about it once because of a boy. I even played pro-line but I lost every single time. boo! I JUST searched for a blog within a Google profile - so difficult! I must make sure mine is linked properly! Um, you totally picked the best costume ever. Comfort is underrated these days. I once went as Supergirl, wearing pjs with Supergirl written on them! I do feel the same for you point #1 !!!! thanks for shout it out! 1 - I actually dont like blogger's default comment system. I dont want to have to use a blogger profile since I dont even use blogger. I'd rather be able to just do name/email/url, but so few blogger platform blogs use a comment system that allows for that. My friend couldn't eat any vegetables or fruit throughout her pregnancy. Fruit made her throw up and the vegetables got her little boy kicking so hard, that she threw them up. He liked chocolate though...and steak...and she was practically a vegetarian! When they link their comments to their google profile, I just give up and decide not to go check out their blog. Lazy, I know. You really are a genius. What a great idea for a costume! Love it! I'm not even going to tell you how much candy I've eaten this weekend. I don't even have a pregnancy to blame it on. 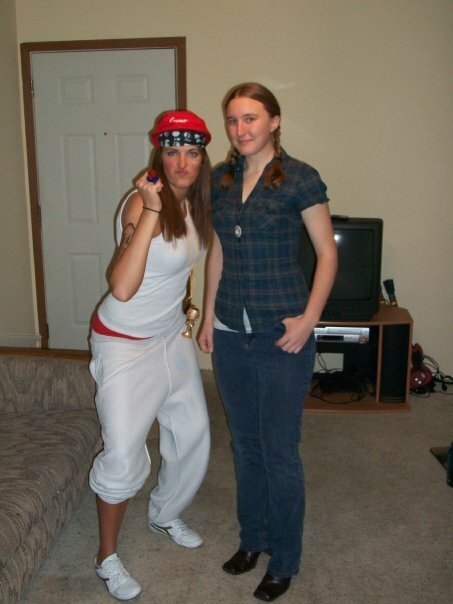 I love the idea of going as a thug for Halloween... so much better than trashy and skanky costumes! I definitely agree with #1. Mine should link to my blog - do you mind checking for me? :) And I was a thug a few years ago for the same reason! Haha. i totally agree about when bloggers have their comments linked to their google profile, too! and your costume idea is genius! Sometimes a blog design overhaul makes everything seem better. I know when I tired of a blog design, I tend to want to not blog. Genius! I want to be a thug too! One time I went to a formal themed "famous couples" and my friend and I dressed up as Jasmine and Aladdin. He loved it! I made him wear inside out sweatpants for his Aladdin pants! I love the costume, i went as a "baby" once so I could just wear my PJs to work. It was awesome. Amen to #1, and you're brilliant for #3. A Thug is a freaking fantastic costume idea!!! I'm totally going to steal it!! !